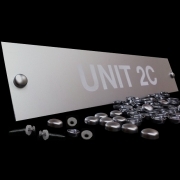 Our new Snap Caps add the ultimate "finishing touch" to your Engraved Signs & Plaques by disguising the sign fixing. 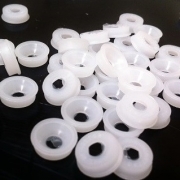 Snap-Cap products are manufactured from food-quality polypropylene. They are available in a range of colours including some rather nice, Satin Silver Electroplated ones, which look fantastic with any Silver Engraving Laminate/Satin Anodised Aluminium or Stainless steel engraved plaques. You'll need to purchase both items seperately. Although it's worth remembering that the plastic washers will fit with any colour of cap featured on this page. Not only do they look great! But the cap and collar encases the screwhead in a water & air tight seal which prevents corrosion. Once inplace the caps are extremely difficult to remove, offering you greater security. Also available are packs of 100, Carbon Steel Screws, 3.5mm dia x 35mm long; which fit our stocked range of caps and collars. Find out how to use this by viewing this document.